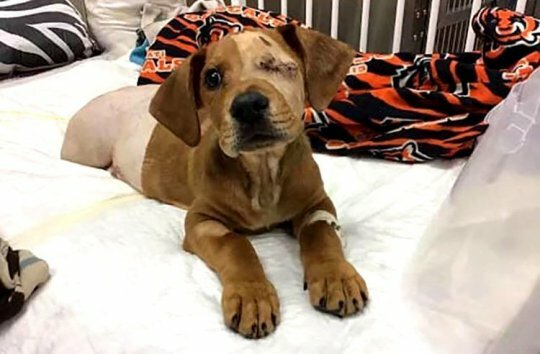 The pup was abandoned at a park in Hamilton, Ohio, and accidentally wandered over train tracks when disaster struck. Trooper, as he is now named, lost his hind legs and tail – which were amputated by the train. He also riptured one of his eyes, which eventually had to be surgically removed. He was saved by the Animal Friends Humane Society and, thankfully, survived the horrendous ordeal. ‘The train amputated both of his back legs, as well as his tail. He also had a ruptured eye due to the train’s impact on his tiny body,’ Tara Bowser, executive director of the organisation, told PEOPLE. ‘Trooper was hospitalized immediately at an emergency vet clinic. 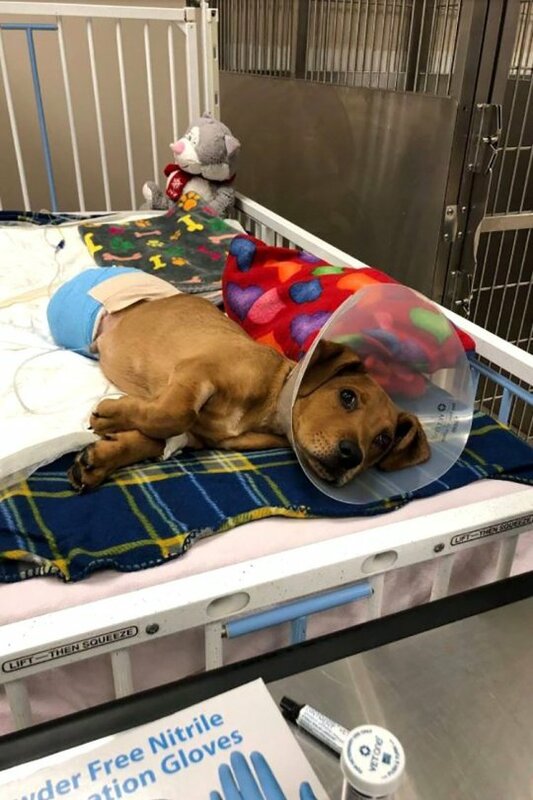 ‘He required surgery to further amputate both back legs and tail, this way the surgeons could clean up the area and have enough skin to suture. His left eye was also removed since it was damaged beyond repair. Despite his extensive injuries and brutal start to life, Trooper bounced back like the, eh, trooper that he is. During recovery, he remained curious and was still up for ‘kisses and cuddles’ from the team. 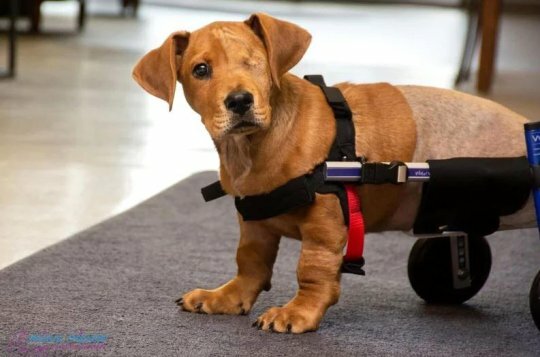 Less than a month after his accident, Trooper was fitted for a doggy wheelchair and thanks to his upbeat attitude and can-do spirit, is already getting adjusted to his new set of wheels. Animal Friends Human Society shared the pup’s progress on Facebook, and soon after he healed, Trooper was adopted and given a forever home – further evidence to that it’s better to adopt, not shop. The new owners have been properly vetted to ensure Trooper won’t have to suffer any more pain; the post states they have ‘experience with disabled animals and someone will be home with him at all times to give him the care he needs’. ‘If you have an animal and can no longer care for it, do the responsible thing and find it another home or surrender it to a shelter that will take care of it. ‘Turning an animal loose to fend for itself is never the answer.